The near-Earth asteroid Bennu is an active asteroid that periodically ejects rocky material into space, according to early results from NASA's OSIRIS-REx Mission. Why it matters: This is surprising, as the vast majority of known asteroids are inactive. 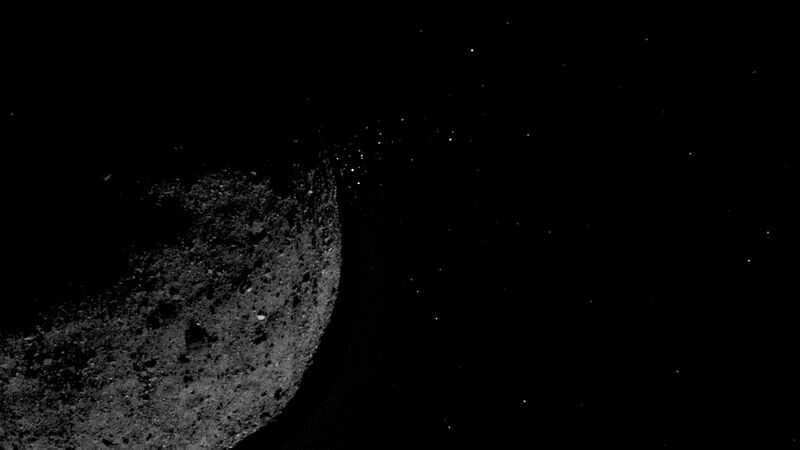 In addition, NASA scientists hoping to land a spacecraft on Bennu to take samples back to Earth in 2023 have found the asteroid contains larger rocks than earlier thought, which could complicate the sampling mission. What they found: The OSIRIS-REx mission began orbiting the asteroid on Dec. 31, seeking to learn more about its composition and movement. It's thought that some asteroids may contain material dating back to the beginning of our solar system, NASA says. The NASA research team first noticed the plumes of material emanating from Bennu on Jan. 6, and they've detected at least 11 more of them during the past 2 months. Some of the material has wound up orbiting Bennu as satellites before settling back down on its surface. “The discovery of plumes is one of the biggest surprises of my scientific career,” said Dante Lauretta, OSIRIS-REx principal investigator at the University of Arizona, Tucson. “We don’t know the mechanism that is causing this right now," he said. From distant observations, Bennu appeared to have a mostly flat surface with some large boulders. However, close-up views showed Bennu's surface is rather rough, with at least 200 boulders of at least 33 feet wide. This means the team has to re-evaluate its plans for how to safely land on the asteroid and collect samples from its surface. One cool thing: Scientists have identified magnetite on Bennu's surface, which is indicative of interactions between rock and liquid water, most likely on the parent body that the asteroid spun off from. Meanwhile, some of the first discoveries of Japan's Hayabusa2 mission to the asteroid Ryugu were revealed in a series of studies published in Science on Tuesday. The studies measure the characteristics of the asteroid, such as its density, spin, shape and more. They found Ryugu has a low density and is a "rubble pile" of rocks that congealed in a surreal, spinning-top shape that may one day spin itself apart.